Owner/Designer of Marquis Rashoid, Marquis Ellison. 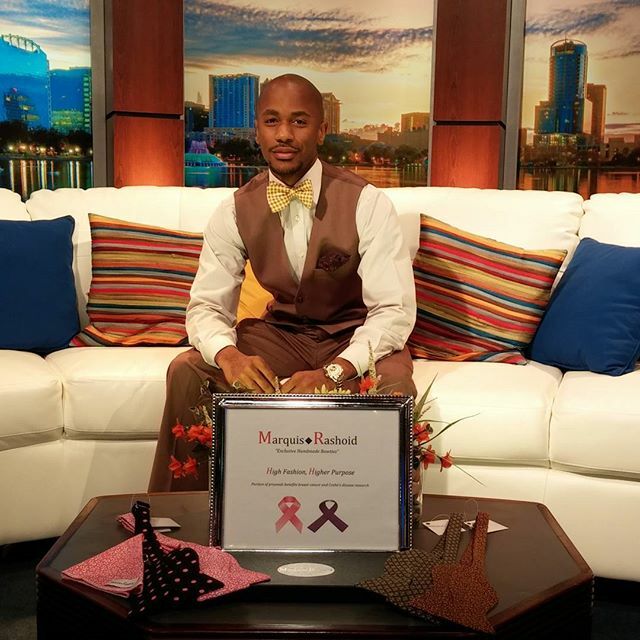 Providing high fashion with a higher purpose, Marquis Ellison, Owner/Designer of his exclusive handmade bowtie company, Marquis Rashoid, discovered his love for fashion at a young age and then determined that it was his calling after college. He attended Florida State University where he earned a bachelor's degree in fashion merchandizing in 2005. In 2009, Ellison was diagnosed with Crohn’s Disease, which, according to Mayoclinic.org is an inflammatory bowel disease (IBD) that causes inflammation of the lining of your digestive tract. He dedicates a portion of his proceeds to Crohn’s disease and breast cancer. Now, a 32-year-old entrepreneur, Ellison saved immensely to tie in his passion for fashion and bow ties. Based in NY, Exclusive Handmade Bow Ties has been in business for fourteen months now and is expanding. However, starting off wasn’t so smooth, failures arose. He expressed how he sent out 20 letters to different universities, churches and boutiques to help him market his products, but only heard back from one. He added that the one response opened a window of opportunities for him. That experience earned him a chance to showcase his bowties at FSU’s bookstore. Ellison’s bowtie collection will be on exhibit at the Tom Joyner Family Reunion Sept. 3-7. “I don’t want all the success just to say I got all the glory,” Ellison said. Ellison explained his motivation, having the privilege to be at the top of his own company. “At the end of the day that’s what it’s all about. I want to be able to do far, and exceedingly more than what I’m able to do,” he said. For more information on Marquis Ellison or the company call 407-443-3064 or visit the website at www.marquisrashoid.com.